Looking for something fun and unique? Shopping for new glassware? 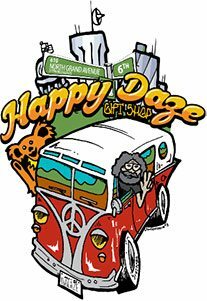 Visit Happy Daze Gift Shop in Springfield, IL, and treat yourself or someone special to a unique gift that’s sure to fit their free-spirited personality. Hippie product enthusiasts throughout the area can come to us for all their vintage-wear clothing, tie-dye, art, body jewelry, tobacco accessories, and much, much more. Our huge selection is second to none, and our staff is courteous and accommodating, making every customer feel at home. Whether you’re shopping for a friend or browsing for yourself – stop by your local one-stop hippie gift shop on North Grand in Springfield, IL! Those in the Springfield, IL, area visit us at Happy Daze for all the things that make them truly happy. In fact, we offer a huge selection and a friendly staff to help you find all that you need. Looking for a new piece of glassware? Stocking up on tie-dye? We’re one place where all free-spirits and wayward souls can come to find items that truly help them enjoy life. Come browse and see what’s waiting for you! We’re proud that people all over Springfield, IL, know our name – we get people from all over the city that stop by to browse for themselves or find a unique gift for a friend or family member. With this in mind, our staff always focuses on providing the utmost in customer service. Whether it’s helping you find a specific product or offering our insight to assist in your search, the team at Happy Daze is here to help make you happy!